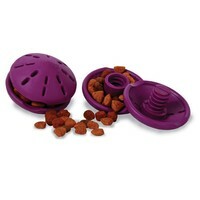 Busy Buddy Twist ‘n Treat is a two piece adjustable rubber treat dispensing toy perfect for any kind of food or treats. Made with an adjustable opening to fit a variety of different sized treats inside, the toy can be twisted wider for easier access to the treats, or twisted tighter to make it more difficult to get the treats for a longer playtime. Fill the Busy Buddy Twist ‘n Treat with your dog’s meal or favourite treats, and watch them roll, twist and shake the toy for hours to get to the delicious rewards inside. A great idea but I find the gap at its smallest doesn't allow the treats out, if its any looser they just fall out as soon as it is moved. I wasn't sure if there was some sort of 'lock' on it that would keep it in the required position. When I tried it in the middle, my dog rolls it round the floor and it seems to close up rather than open so he loses interest after a short while. A great value and robust product that our dog absolutely loves and keeps him entertained for ages! Made of extremely robust rubber, the Busy Buddy Twist 'N' Treat is an excellent quality toy that my terriers adore! I love the fact that it's adjustable to the size of your preferred treats or dog's ability. Awesome price too, as with most VetUK stock! Very strong and lasts for ages but I found that it either had to be so tight treats wouldn't come out or so loose they wouldn't stay in. GSD got bored with it pretty quickly and staffie collie not really food orientated so gets left in bottom of toy box. Too soft for strong chewers. This seems like a great toy for a small-medium dog. The way you can unscrew the toy to make it easier or harder for the treats to fall out is really smart. Unfortunately in under an hour my 38kg Husky/Malamute unscrewed it all the way (they're pretty dextrous for dogs!) and chewed the plastic until it was a mess. If they made an extra-strong version of this, that had a locking system so it couldn't be taken apart, I'd definitely buy it again, but I wouldn't recommend for larger dogs. This is one of the best toys I've ever bought for my border collie. I bought it when he was a few months old and he still enjoys it just as much now he is an adult. Very durable, great value, easy to clean and you can adjust it to cater for any size of treat. It is just as good as a Kong and Kong Wobbler at a fraction of the price. A very, very good toy. I have the big one for my pup and it is nice and big and heavy, I like that when the food is trapped in my Staff can put his tongue in and sniff the vents which really keeps him at it for ages the only thing i can't rate is the longevity but only time will tell how long it will last, but I am very optimistic and very impressed so far. This is a well made toy and the dog enjoys rolling it round to get the food. Even on the hardest setting the kibble comes out quite quickly so the fun does't last long. Also, I bought the small for a toy dog and I can't even get half her portion of food into it. Not as good as I'd hoped but at that price I'm not complaining! I would recommend this toy to anyone with a dog just like mine that "inhales" food. It's a good quality toy made of rubber therefore it isn't loud as other interactive toys made of plastic when rolled around on hardwood floors or tiles. At £4.90 for the large size it is a truly unbeatable price. Thank you VetUK. This twist and treat is one of my favourite interactive toys. You have the control as to whether you make it easy or difficult for your dog to get the treats out of the toy. The holes at the top and bottom mean that your dog can smell the food inside, unlike the enclosed products. The shape also means it doesn't roll around too much. I love it!